Our villa is set in a larger than average plot, affording you maximum privacy and an amazing feeling of space. The Emerald Plus is a new generation of prestige 5 bedroom villa design, incorporating 2 master bedrooms with their own ensuite bathrooms and three twin bedrooms sharing a third bathroom. 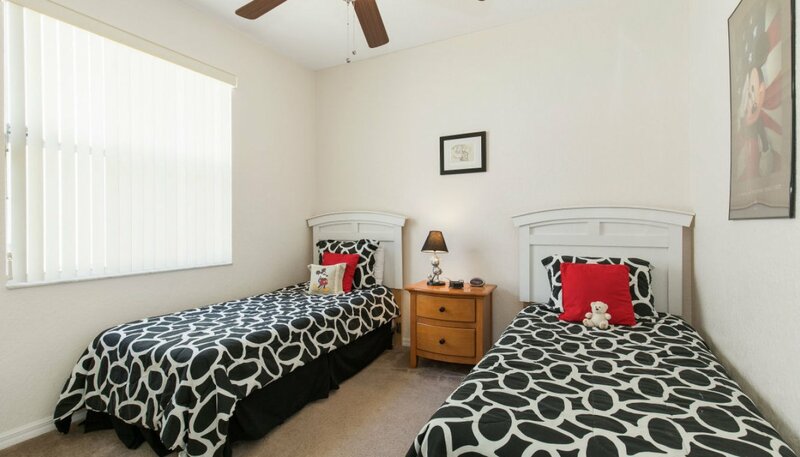 One of these rooms can be converted to a king bed on request. This overcomes the problem of deciding "Who gets the master bedroom?" 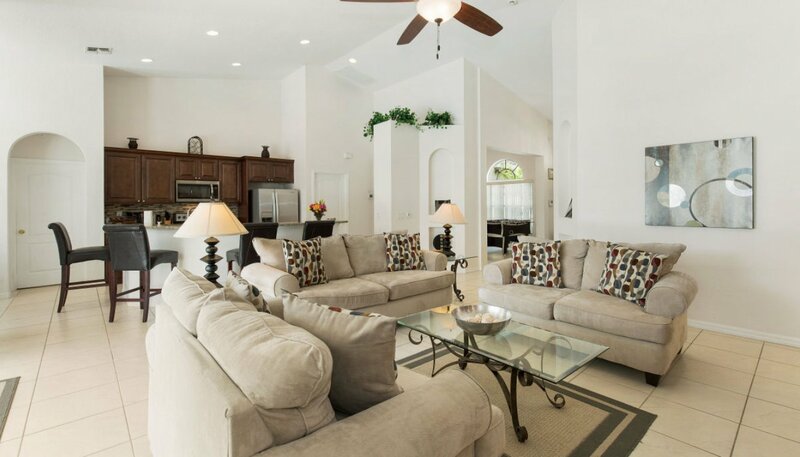 making our villa extremely popular with 2 families sharing. There are no villas behind ours, just a strip of sparse pine trees giving some but still allowing a great view of the 18th hole. You won't hear any traffic noise around our villa - just the sounds of nature. Look out for Highlands two resident cranes. Fully equipped kitchen with oven, microwave, Dishwasher, Fridge/Freezer with ice maker and chilled water dispenser - nothing left out! Lightening high speed 75Mb Wireless DSL Internet - use your laptop/tablet anywhere!! Keyless entry system - no need for key collection - late arrivals not a problem !! 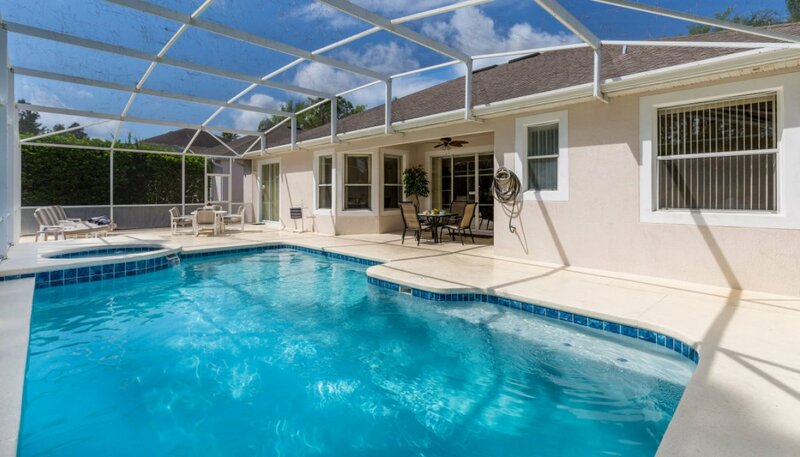 Private screen and heated 32ft pool and separate spa with light to enjoy a evening swim! 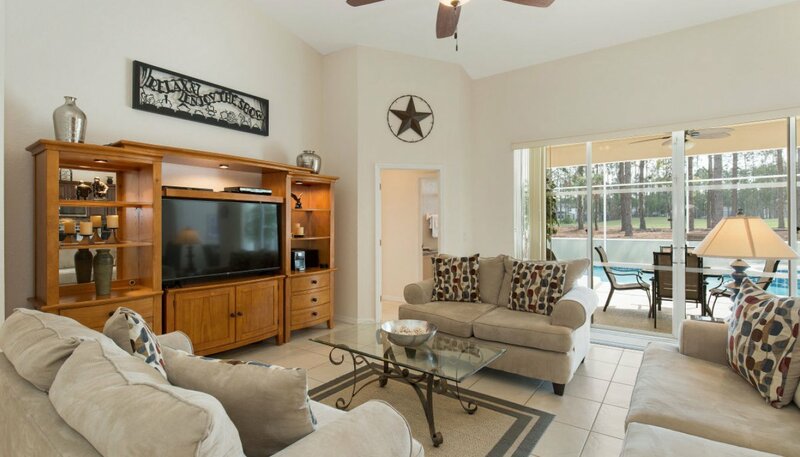 This spacious and comfortable living area provides a perfect place to relax and enjoy a film on the fantastic 55" 4K LED HD TV. There are over 255 Fibre-Optic channels + TV & Movies on Demand for you to choose from including BBC America and a sports channel showing English Premier League Football. We also provide a DVD player. 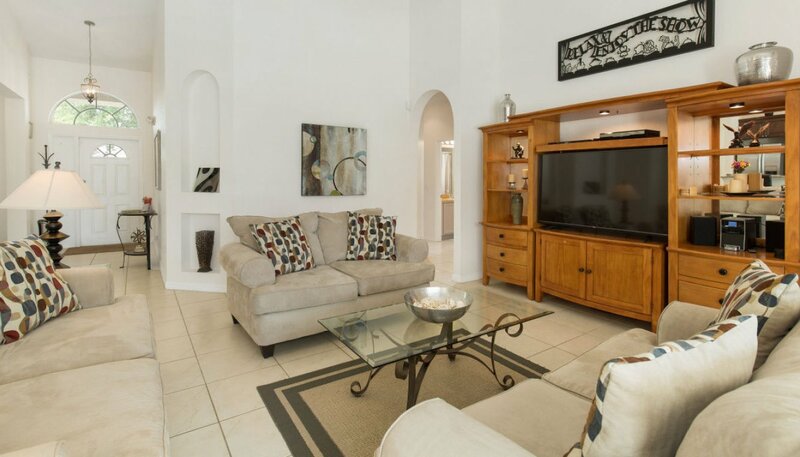 This lounge area has three sofas (a 3 seater and two 2 seater) for you to relax on and also has a large ceiling fan in this area in addition to the air conditioning. In addition you can rent DVDs and Wii games from RedBox at Publix - Only 4 minutes drive and next to an excellent Chinese Takeaway and Pizzeria which delivers to Highlands Reserve. If you just fancy listening to some music, there is an iPod Docking Station and CD Stereo & Radio. We also provide an additional portable CD Player to play music whilst relaxing outside by the pool. Why not just choose a book from the selection provided in the entertainment unit and sink into comfy sofas inside or sun loungers outside, relax, unwind and take a well deserved rest. 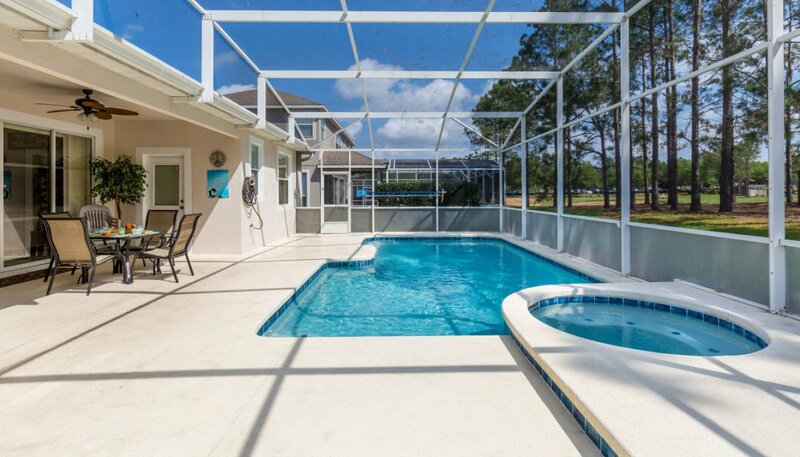 Sliding doors (Alarmed for child for safety) lead directly from the family room to the pool deck and give wonderful views of the pool and the 18th hole of the golf course beyond. 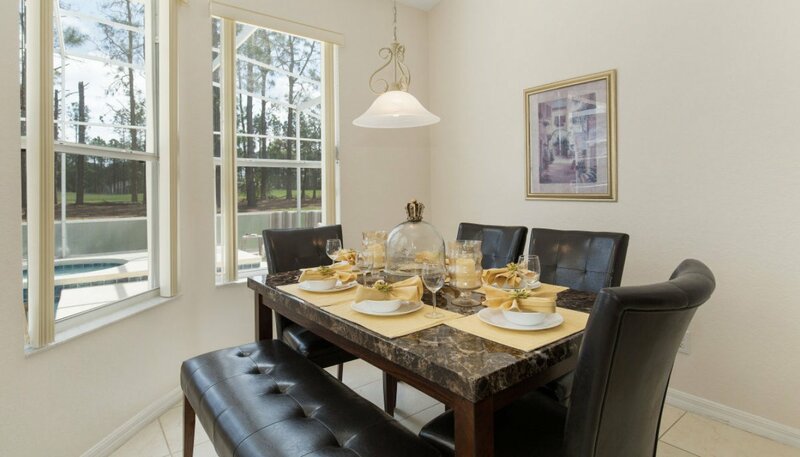 The dining room (adjacent to the kitchen) has wonderful views over the pool deck and golf course beyond. The formal/modern dining table and 4 chairs and a bench seat provides comfortable seating for 6. 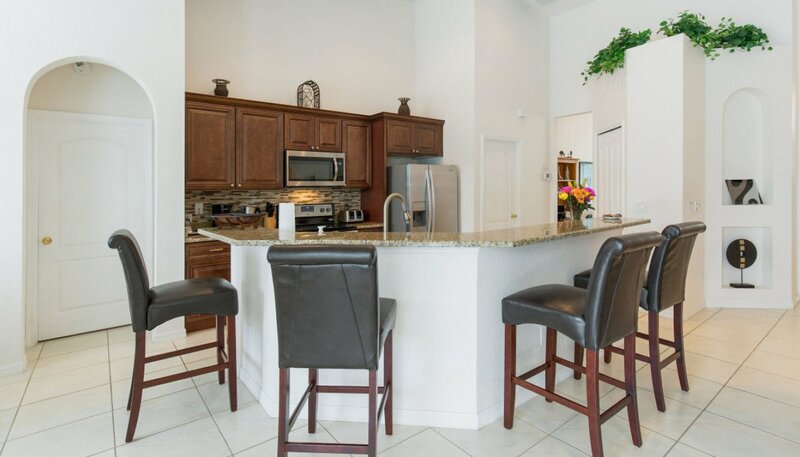 There is additional comfortable seating for 4 at the breakfast bar. 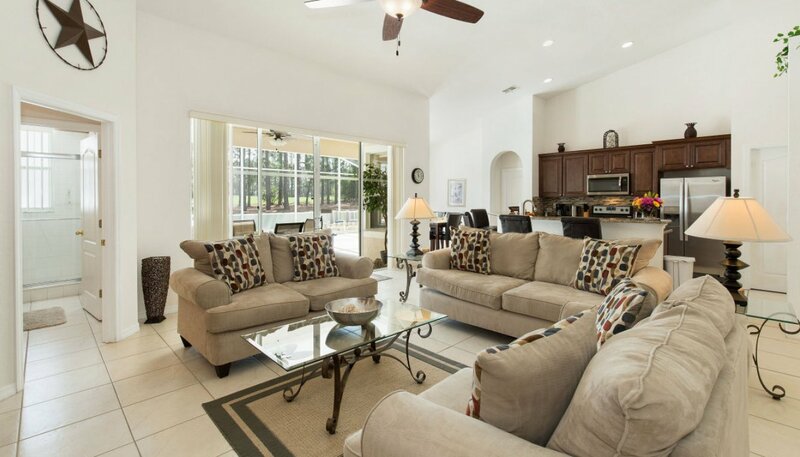 From the sliding doors from the lounge area next to the dining room there is direct access onto the covered porch/lanai area where additional patio tables and chairs provide seating for 8 for private alfresco dining. 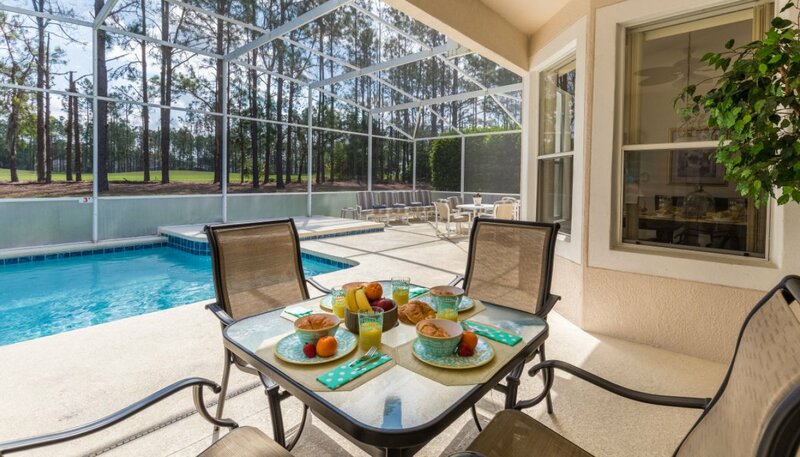 So wherever you choose to eat you can see the great views of the pool and golf course. 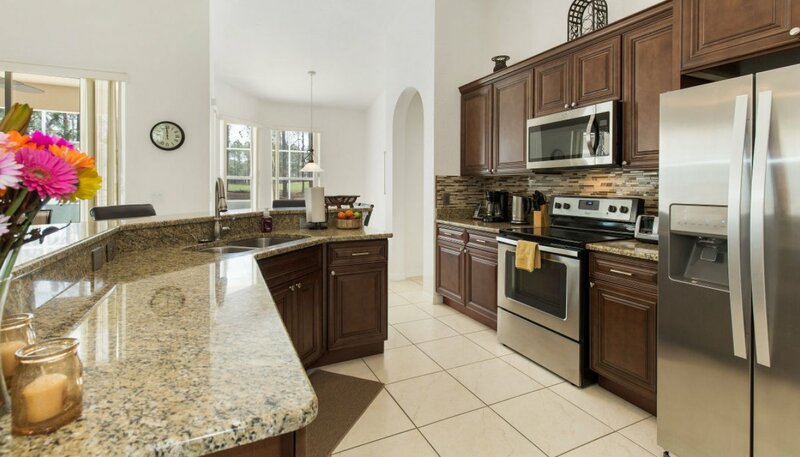 The kitchen has a breakfast and snack bar and is fully equipped, including a large Fridge / Freezer with ice and chilled water dispenser, cooker, microwave and dishwasher. The utility room just off the kitchen has a large washing machine, a seperate matching tumble dryer, iron and ironing board. 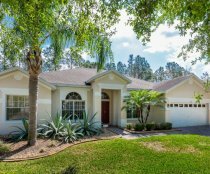 The large master bedroom with it’s wonderful views over the pool deck, and golf course beyond has been furnished with a king sized bed, walk-in wardrobe, cable 32" TV & DVD player and alarm clock radio. This room also has an ultra silent ceiling fan. 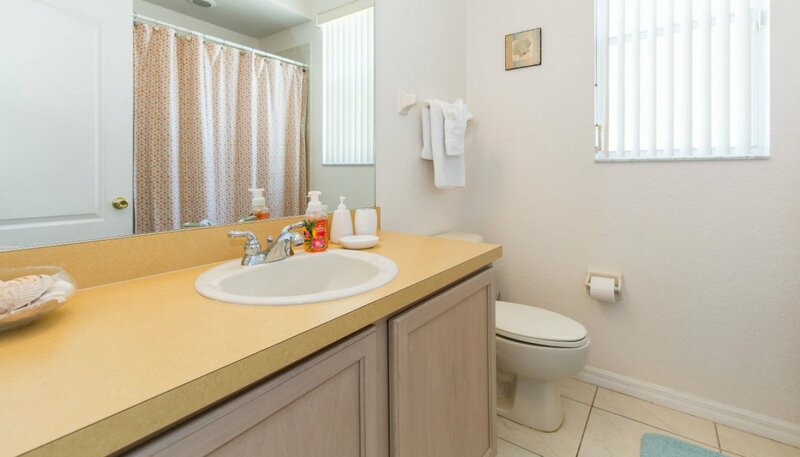 The connecting spacious ensuite bathroom has a large corner bath, walk-in double shower, his & hers sinks and separate WC. This bathroom comes equiped with hairdryer. 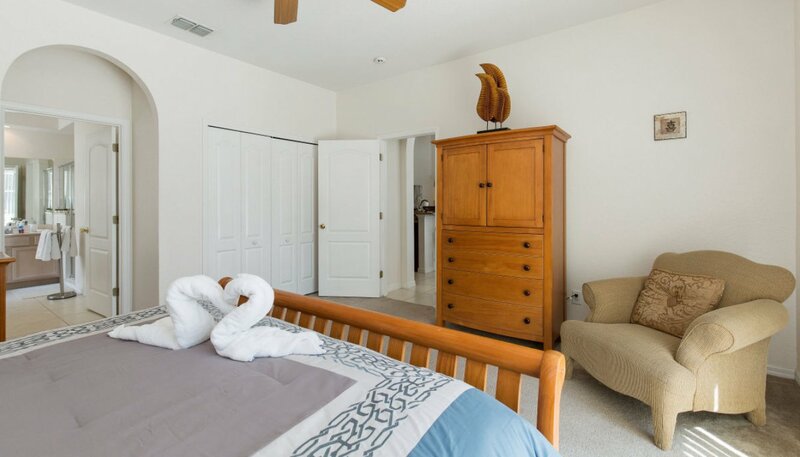 This master bedroom with it’s views over the pool deck has been furnished with a queen sized bed, built-in wardrobe, cable 32" smart TV and alarm clock radio. This room has an ultra silent ceiling fan. 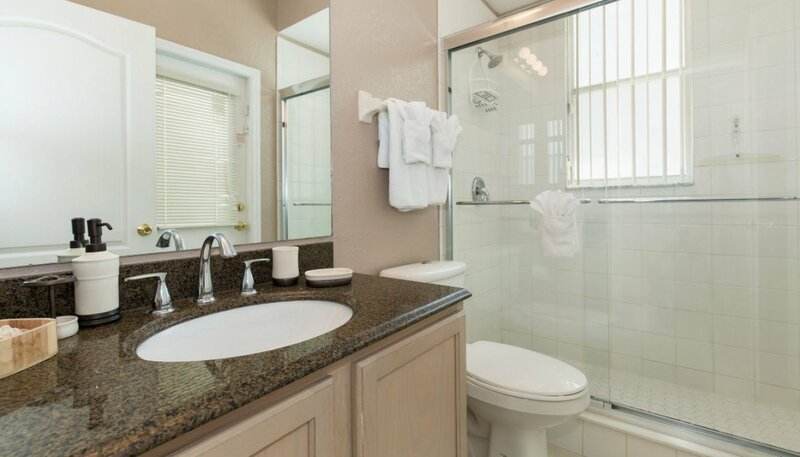 The connecting ensuite bathroom has a large walk-in shower, built-in sink unit and WC, with separate door out to pool deck. This bathroom comes equiped with a hairdryer. 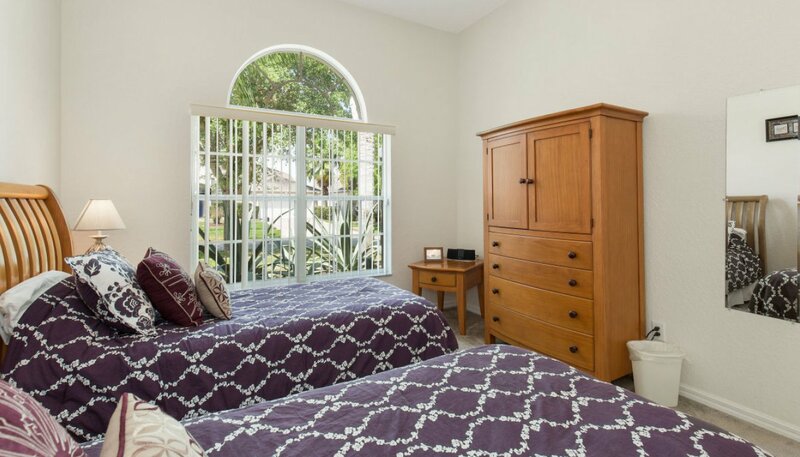 This bedroom comes equipped with twin sized beds which can be joined to make a King sized bed on prior request in the booking form. 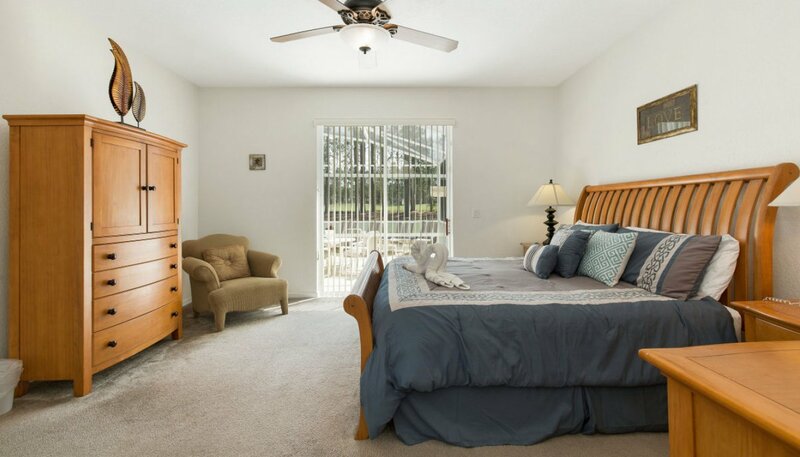 This room also has a 32" cable TV & DVD player, iPod docking station, ceiling fans and a built-in wardrobe. 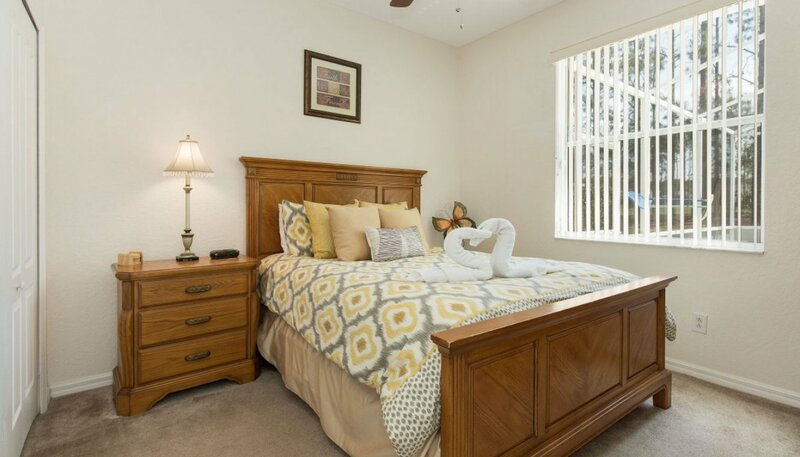 This bedroom features twin sized beds with built-in wardrobe, ceiling fans and cable TV. 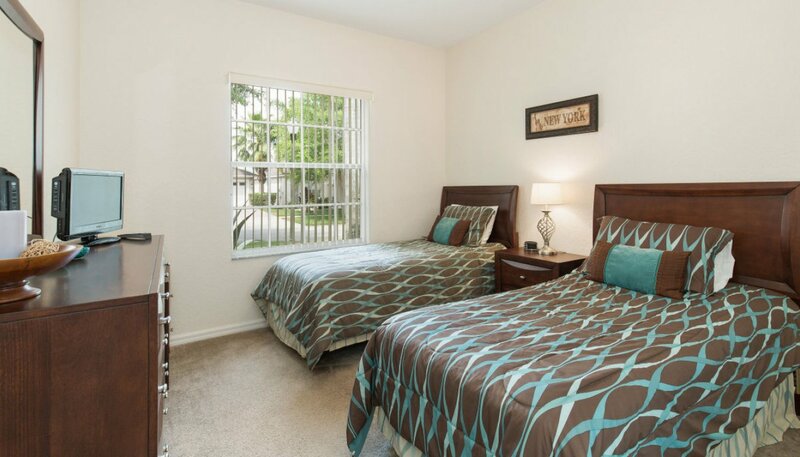 This bedroom features twin sized beds with built-in wardrobe, ceiling fan and TV for use with DVD player. 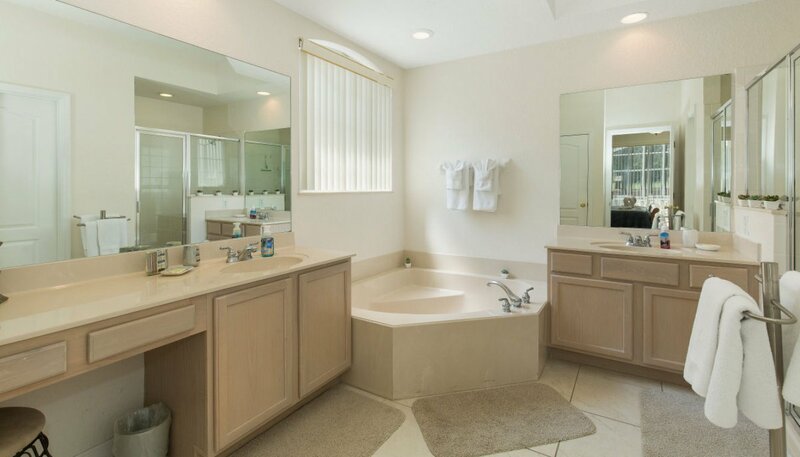 This family bathroom is shared between bedrooms 3,4 & 5 and has a bath with shower over, WC and built-in sink unit. 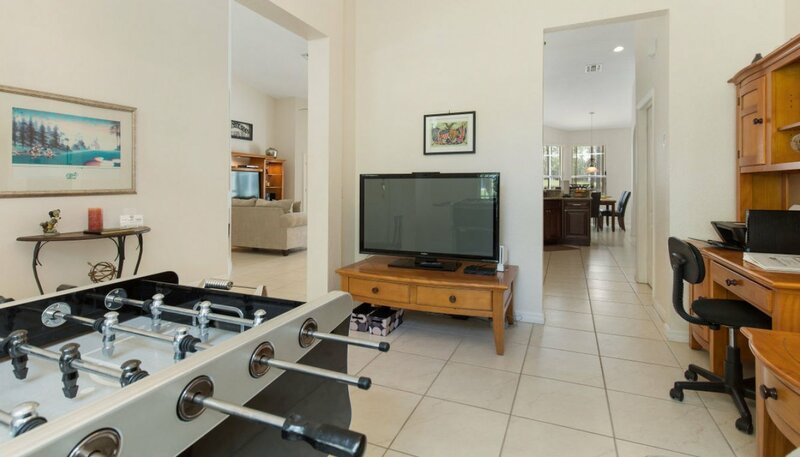 Containing a 2 seater sofa, a Foosball Table, Playstation 2 with games, 50" LED cable TV, a Wii Sports package and wireless printer. The luxurious 32ft x 16ft swimming pool and spa can be heated if required, and offers superb views overlooking the 18th green of the championship golf course. There are patio table and chairs, and for your sun bathing comfort there are 4 sunloungers. For the ultimate in alfresco dining experience, we can provide a gas BBQ for $50/week - please request this in the booking form and we will ensure a clean BBQ with tools and full gas bottle is delivered to the villa. 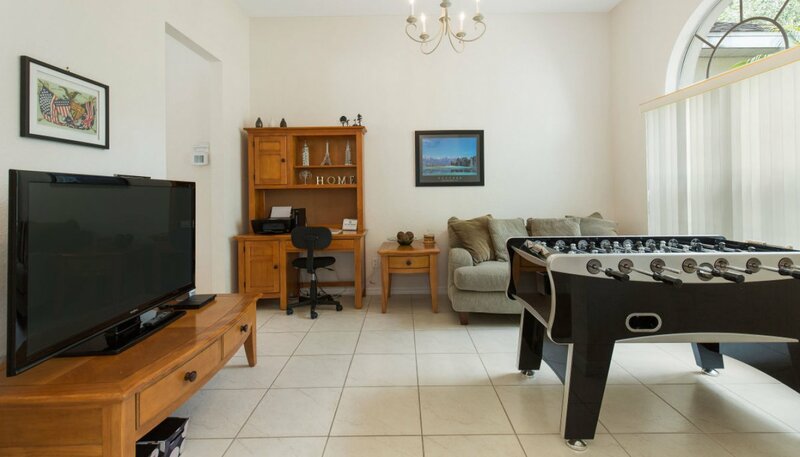 You can also access the internet and your emails through our high speed 75Mb wireless internet throughout the villa and pool deck. We include a cot (crib) & highchair for young families - please request these items in the booking form. 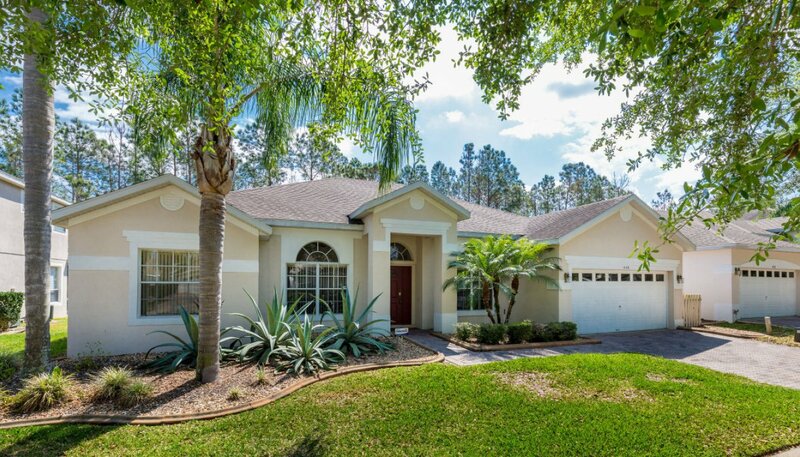 Lovely stay, great villa, close to Disney, thanks for having us.